FROM NAMI San Gabriel Newsletter: Born is 1858, Theodore Roosevelt, the 26th President of the United States, was not blessed with strength, as least not physical strength. He was an asthmatic and a sickly child, who had to be home schooled and was frequently confined. However, he would not let his physical limitations hinder his thirst for knowledge. He became an enthusiastic student of nature, including taking up taxidermy at the age of 7. Encouraged by his father, he began a determined search to improve his strength and health. 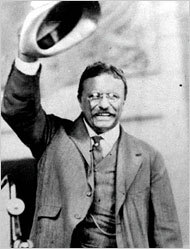 As a result, Roosevelt transformed himself from a weak child into a strong, manly adult; his body finally followed the might and intelligence of his mind. Prior to becoming president, Roosevelt formed the First U.S. Voluntary Cavalry Regiment, more commonly known as the Rough Riders, at the beginning of the Spanish-American War. The Rough Riders consisted of cowboys and Ivy League friends of Roosevelt from when he attended college and law school. Upon leaving the Army, Roosevelt was elected governor of New York in 1898. Because of his desire to eradicate corruption in politics he was chosen as William McKinley’s vice presidential running mate for the 1901 presidential election. However, Roosevelt was thrown into the presidency much sooner than expected. On Saturday September 6, 1901, President McKinley was shot. Eight days later he died and Roosevelt became the youngest president in United States history, at the age of 42. In 1904 he was elected president in his own right. While in office, Roosevelt helped complete the Panama Canal and negotiate an end of the Russo-Japanese War, for which he won a Nobel Peace Prize. Four presidents have won the award three while in office, Theodore Roosevelt, Woodrow Wilson, Barack Obama, and one was not in office, Jimmy Carter who won in 2002. At the conclusion of his second term, Roosevelt left to tour Africa and Europe. Part of his goal was to bring back specimens for the American Museum of Natural History (one of the elephants he shot remains on display to this day). While campaigning in Milwaukee, Wisconsin, an assassination attempt was made on Roosevelt. He was shot in the chest, but the bullet was slowed down after passing through his eyeglass case and a copy of a speech he was about to deliver and did not puncture his lung. Instead of allowing himself to be taken to a doctor, he went on to give his speech that day. Ultimately, however, he lost his bid for a third term to Woodrow Wilson. Roosevelt’s days were routinely jammed with undertakings, whether it was related to his job or leisure activities. He would often read more than a book a day. As president he wrote an estimated 150,000 letters. It is this, along with his extreme high energy that some historians believed that Roosevelt exhibited signs of hypomania and may have had bipolar disorder. However, unlike the majority of individuals with bipolar disorder, Roosevelt may not have experienced the other end of bipolar disorder: depression. In her book “Exuberance the Passion for Life”, Kay Redfield Jamison suggests that 15 percent of individuals with bipolar do not become depressed. Theodore Roosevelt was able to channel his bipolar disorder and as a consequence, the nation prospered. Historians credit Roosevelt with changing the way the office of the president is viewed by making character as important as the issues. This entry was posted in Awareness, Bipolar, Mental Illness and tagged Theodore Roosevelt. Bookmark the permalink. Pingback: Book Review | Guest of Honor: Booker T. Washington, Theodore Roosevelt, and the White House Dinner That Shocked a Nation by Deborah Davis [Contributor] | Attack of the Books!